With Quick report it only takes one click to download a web analytics report as a .CSV table or as a .PDF document. .CSV format is used to present text data as a table. The advantage of such report is that you can review and edit it by means of generally available applications: Microsoft Excel; OpenOffice.org Calc; Numbers; Notepad; CSVed; KSpread; Emacs; Google Docs. .PDF format is convenient when you need to present graphic data in electronic format (graphics, diagrams etc.). You can review the .PDF reports using cross-platform software Adobe Acrobat PDF; .js; Evince and many others. When comparing web statistics data for the required date range, the user can study dynamics of position changes for the keywords added to the project. Each time you make some alterations to the website structure or add new content, you observe position changes. We recommend you to work with a wide date range not to miss any key factors that contributed to the position change. You can save web analytics reports using the Quick report feature. Show positions. General statistics of the keyword positions queries for the selected date range. Compare. Comparative analysis of position changes for the selected date range. Quick report configuration and download. Then select a type of your report: Show positions or Compare. Using quick reports you can easily work with data selection. 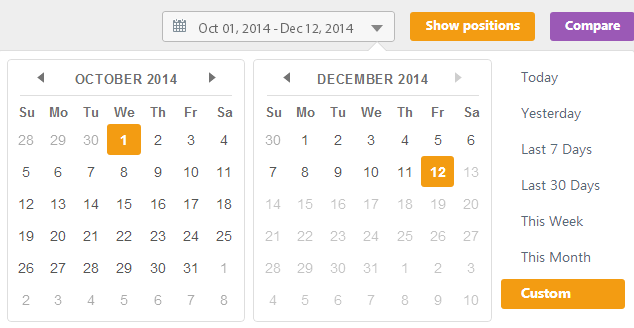 Select the required date range in the calendar. Open All rankings in the Website positions section and select a filter to generate the report. Click the button CSV or PDF in the Quick report field to generate the required report. 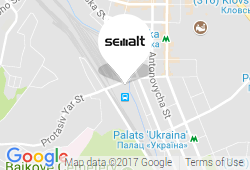 What filters in the Semalt system can be used to generate quick reports? What formats can I use when generating reports? You can save reports in .CSV and .PDF formats. Where can I find the saved reports? The generated reports are saved to the default download location specified in your browser.